On Today's edition of Chopsticks, we will teach you how to make Salt Grilled Razor Clams. The clams are sauteed with sea salt and an assortment of spices and herbs. The yummy seafood dish is complimented by a special sauce on the side. 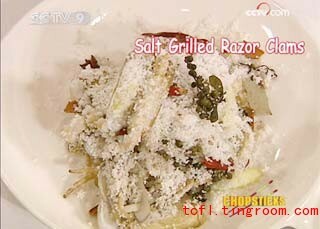 So let's learn the recipe for Salt Grilled Razor Clams.